A journey “where you arrive as an individual and leave as a team”. 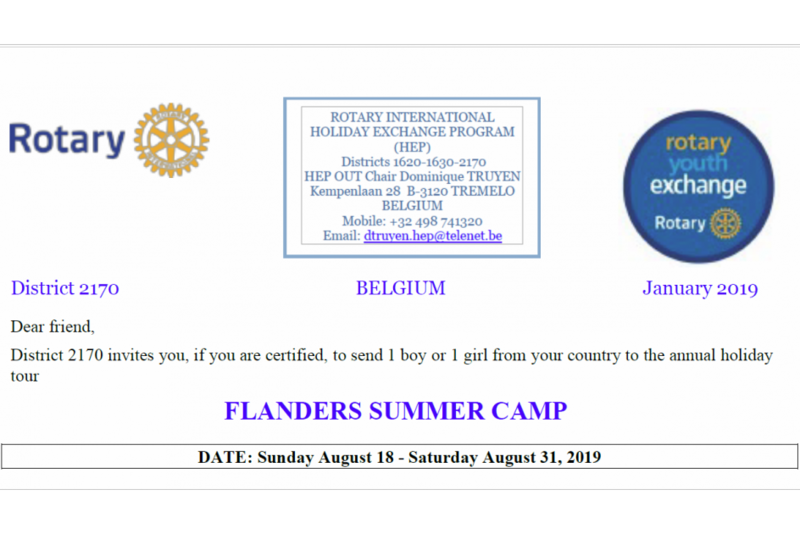 On the program: Discover Antwerp, teambuilding activities, day trips to Bruges - the Venice of the North, Ghent, Brussels, meeting with Rotary clubs and much more…Full accommodation and meals will be provided by District 2170 and several Rotary Clubs. The team will stay in a Youth Hostel. A detailed program will be sent end June. Brussels Airport (BRU) or Antwerp Central Station, where participants will be welcomed by Rotarians. Please organize arrival before 17:00 and departure after 10:00. There will be NO pick-up or drop-off at Charleroi Airport (CRL or Brussels South Airport). Participants arriving there will have to make their own way to and from Antwerp by bus and train. camp fee 250 Euro, payable at BE88 0689 3107 5341 (BIC GKCCBEBB) after acceptance. The camp organization only foresees normal European and vegetarian meals. Marcel Zuckerman RC Antwerpen-West: zouki1 (at) telenet.be, +32 475 820. April 15, 2019. Please notify us immediately if your candidate can’t come so that we can give another candidate the opportunity to attend.